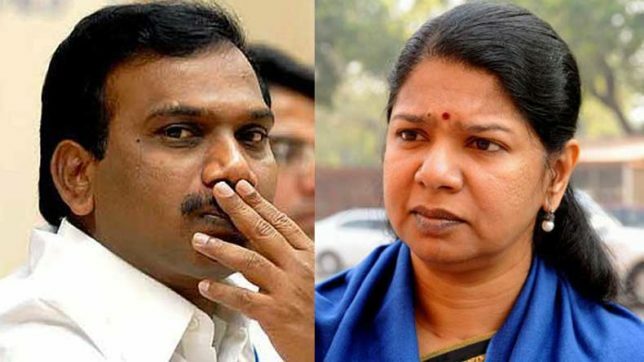 A special court today acquitted all 18 accused including A Raja and K Kanimozhi in 2G spectrum allocation case. The scam came to light almost seven years ago when India's auditing agency Comptroller and Auditor General or CAG in a report held then Telecom Minister A Raja responsible for causing the state exchequer a loss of Rs 1,76,379 crore by allocating 2G spectrum licenses at throwaway prices. But, today the court found that the prosecution failed to prove the charges. The case involved allocation of 122 telecom licences, bundled with spectrum, at prices determined in 2001 on a first-come-first-served basis by then telecom minister A Raja in 2008. The Comptroller and Auditor General said that by not auctioning these airwaves, the government suffered a notional loss of Rs 1.76 lakh crore. CBI pegged the loss at Rs 30,984 crore. The Supreme Court declared the system of allocating airwaves faulty and cancelled the 122 licences belonging to nine telcos in 2012. Allegations: A CBI charge sheet alleged that Raja conspired with the accused and arbitrarily changed the first-come, firstserved policy to ensure that Swan Telecom Pvt. Ltd. (STPL) and Unitech received licences. Charges: Criminal breach of trust by a public servant (Section 409), criminal conspiracy (Section 120-B), cheating (Section 420), forgery for purpose of cheating (Section 468), using a forgery for purpose of cheating (Section 468), using a forged document as genuine (Section 471), booked under Prevention of Corruption Act for criminal misconduct and illegal gratification. Allegations: The CBI alleges that Kanimozhi, majority shareholder of Kalaignar TV and daughter of DMK chief M Karunanidhi, conspired with Raja to route Rs 200 crore from DB Realty and Swan Telecom cofounder Shahid Balwa to the TV company in return for grant of spectrum to Swan Telecom. Kanimozhi was charged with tax evasion by the income tax department in Chennai. Charges: Criminal conspiracy (Section 120-B) and booked under the Prevention of Corruption Act for illegal gratification by a public servant.